Mari and I have been taking an Intro to Bee Keeping class for the last two months. 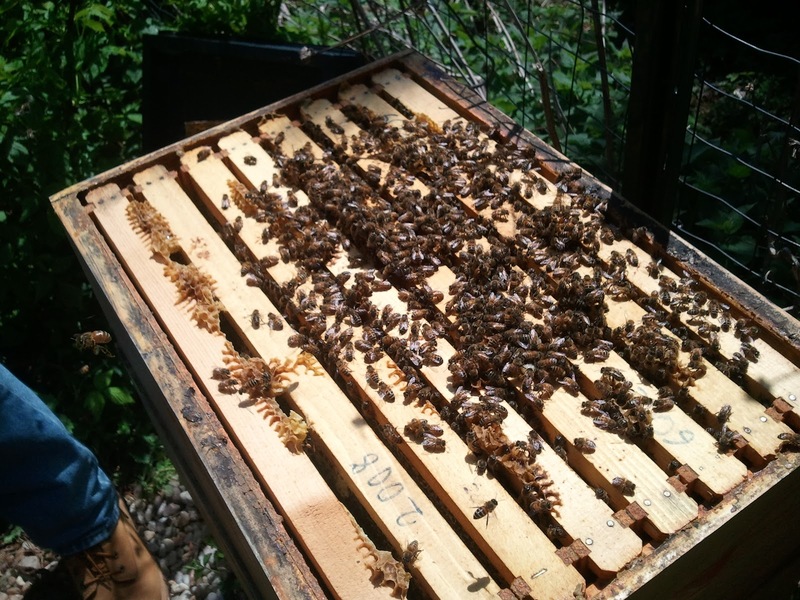 The class was taught through the Beekeeping Association of Northern VA (BANV). 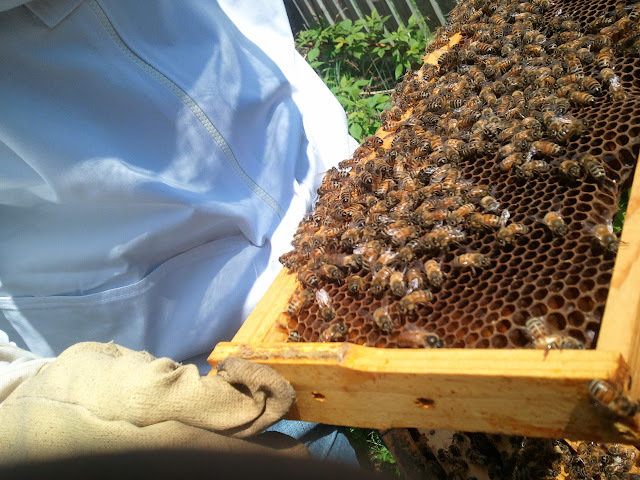 They hooked us up with a mentor, named Dave, and today we went to his house to check out his hives. He had extra veils and jackets, which we wore with jeans. 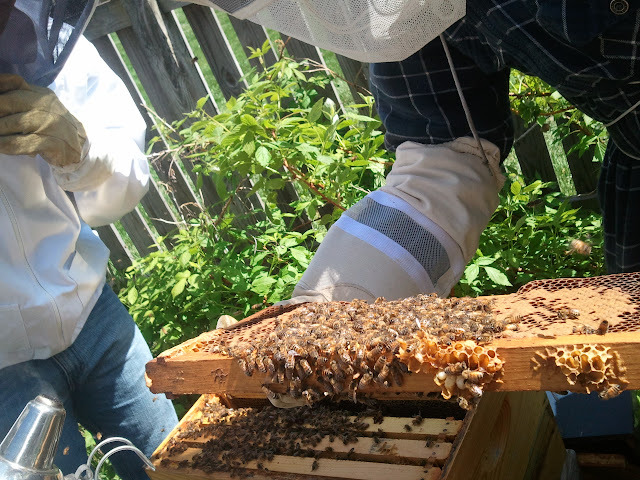 Although standing next to the hives did not phase me in the least, once he opened them up and the bees circled in every direction, that was a trip. 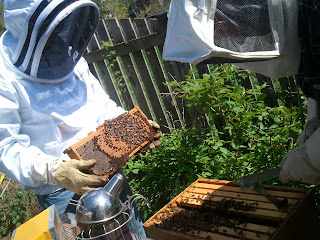 Buzzzzzzzzzzzzzz. Dave has 6 kids, 2 older boys and then 4 girls. They all seemed pretty cool. What struck me was the way they interacted with each other. No chaos, everyone very calm. One of the girls, I think she was around 6 years old, rested her head against me like a kitten. I started instinctively petting her head. Dave's wife said, "She's very tactile, she explores the world through touch." Then she pointed to the feather in the girl's little hand that she caressed. Behind us one of the other girls was swinging high on the playground, "Don't swing so hard, you might knock into your sister and then she'll fall over and it will be your fault." Then Dave's wife looked at me and said, "She's our wild one." I loved how she understood the differences in her children and just goes with it. I could of imagined another mother telling her daughter not to nuzzle me, or apologizing for having touched me, and then freaking out when the other daughter was swinging too high. The best part of the trip was when he let us taste a spoonful of last season's honey crop. Most delicious! I could tell that they have their stuff together and I hope I get to learn a little more from them both about bees and how to be a successful parent. Dave lives a few miles from our house and Mari suggested we bike there instead of drive. 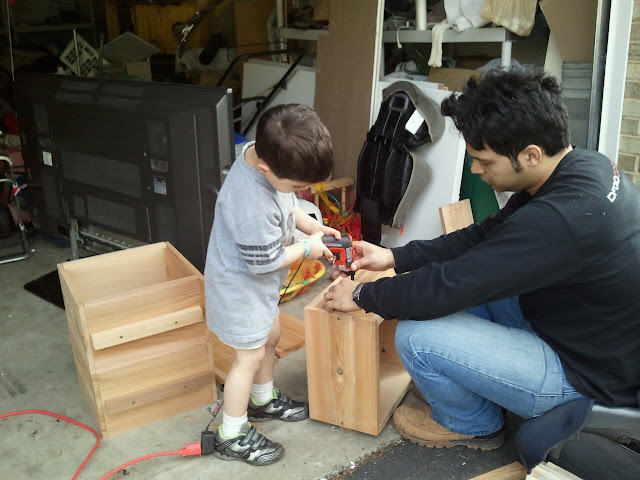 Half way there, on the beautiful sunny spring day, I congratulated him for suggesting the great idea. "Doing my part to prolong the recession and keep consumer spending low." He responded. "Yup, I don't want Obama to be able to say that consumer spending index is up and we're out of the recession." here I thought that we were trying to save the environment. I think the world needs a new way to gauge progress. Consumption cant be the most accurate measure of prosperity. Especially not when people are raising there own food and biking around town.